Steven Stamkos got the monkey off his back Tuesday when the No. 1 pick in this summer's NHL Entry Draft assisted on a goal against Toronto, getting his first point in his eighth game in the League. But the Tampa Bay Lightning center had his official coming-out party Thursday night at HSBC Arena. Stamkos scored his first two NHL goals and added an assist for a three-point night and the Lightning rolled to a 5-2 win over the Buffalo Sabres for their second straight win and third in four games. "Everybody loves the kid and they know what he had been going through," Lightning coach Barry Melrose said about the rookie. "They really rallied around the guy." Jussi Jokinen, Ryan Malone and Paul Ranger also lit the lamp as the Lightning enjoyed their best offensive game of the season and supported goaltender Olaf Kolzig, who made 29 saves. "We really played our best game," Stamkos said. "We've been doing things the last few games that we weren't doing in the beginning of the season." Thomas Vanek scored his League-leading ninth of the season and Clarke MacArthur had a goal for the Sabres, who also lost 5-2 at home to Ottawa on Monday. Buffalo has lost three straight overall. Stamkos scored his first NHL goal on a Tampa power play 9:51 into the first, although he wasn't credited with it until after the period. Vincent Lecavalier originally was announced as the scorer, but Stamkos got a stick on the captain's slap shot from the top of the right circle and deflected it past Ryan Miller. "I knew it hit my stick right from the beginning, and Vinny knew that too, so it was just a matter of them correcting it," Stamkos said. "I had some butterflies when they announced Vinny as the goal scorer, but he told the ref that I tipped it in. It was obviously a great feeling when they corrected it." Jokinen and MacArthur scored 29 seconds apart later in the first before Malone got what turned out to be the game-winner when he made it made it 3-1 with 26 seconds left in the period. The Lightning increased their lead to 5-1 when Ranger and Stamkos scored 1:50 apart in the second period. The second of the night for Stamkos came after he took a pass from Adam Hall and beat Miller with a slapper from the right circle. "He's a fast player. I think tonight was his first couple goals," Sabres defenseman Jason Pominville said. "Fast player, skilled player … and I mean, every player that gets drafted that high, a lot of things are expected out of him, and he definitely showed he's an elite player and we'll have to have an eye on him." Vanek deflected an Andrej Sekera shot past Kolzig with 20 seconds left in the second, but Buffalo was outshot 11-9 during a scoreless third. The Sabres will try to break their slump Saturday night when they host Washington. "It's a tough League to win in. Tonight we got dominated, and there's no excuses for it," Vanek said. "We had a day off the other day, everyone was fresh and (Tampa) just came out better. We've got to put this one behind (us) and be a lot better on Saturday. "Adding younger players for better play is a tall order..."
"We needed a win last night more than anything..."
At first glance, 4-4 might seem like a modest beginning to the season, but for a young Phoenix squad fighting for a playoff berth in a tough Western Conference, the franchise's best start since the 2003-04 season is a solid building block. Shane Doan registered a three-point night, including a pair of goals, and Ilya Bryzgalov made 27 saves as the Coyotes sent Pittsburgh out of Jobing.com Arena not only with their third straight defeat but an injured superstar lost as well. Sidney Crosby left early in the second period with an undisclosed injury and did not return. Neither the captain nor the organization clarified after the game exactly what was wrong, but television replays showed Crosby skate to the Penguins bench, sit down with a grimace and try to collect himself. Kevin Porter scored his first NHL goal, Olli Jokinen also lit the lamp and Steven Reinprecht added a pair of assists for Phoenix, which began 2003-04 at 3-3-2 but finished out of the playoffs. The Coyotes haven't been there since the 2001-02 season. Miroslav Satan's power-play goal in the second drew the Penguins even, but it was all Coyotes from there. Doan struck on a power play 2:01 before intermission, depositing Reinprecht's pass into an open left side of the net. Porter made it 3-1 with 5:11 left in the third, also converting off a Reinprecht feed and beating Marc-Andre Fleury to the blocker side. Pittsburgh is 0-2-1 on a four-game road trip that concludes Saturday in St. Louis. ''The system's only 50 percent of the game,'' Penguins coach Michel Therrien said. ''After that, the players have to play hard. It's an excuse." In finding reasons for New York's franchise-best 10-2-1 start, a couple names in particular jump out: Henrik Lundqvist and Nikolai Zherdev. Lundqvist stopped 27 shots while Zherdev scored a highlight-reel goal in the third to give the Rangers a temporary lead, then assisted on Dan Girardi's goal that held up as the winner. Heading into the third period with the game tied 1-1, the Rangers were aware a piece of history was on the line, thanks to their coach. "Tom (Renney) said a few words before the third period and talked about the record and how long this franchise has been playing hockey," said Lundqvist, who leads NHL goalies with eight wins. "It's a big deal and we definitely wanted to go out in the third and play our best period of the night." Zherdev has 3 goals and 7 points during a four-game win streak by the Rangers that began last Friday when he put up a goal and 2 assists in Columbus against his former team. "Unbelievable," said defenseman Paul Mara, who contributed two assists. "He might be the most skilled guy I've played with, and when he puts it all together like he has in the last week, week-and-a-half, no one can stop him. It's good to see that. We need his skill out there. He's been doing it on a regular basis now." Zherdev put the Rangers up 2-1 with a power-play goal 6:58 into the third, taking the puck away from Atlanta defenseman Tobias Enstrom before he could clear it, skating into the slot and going top shelf on Kari Lehtonen. "He's so good with the puck," Lehtonen said. "It looked like he was going to go all the way to the other side, but he was able to put it up very quickly before I even knew it. He's just one of those guys that you don't want to let alone in front of the net. Usually something bad happens." The Thrashers got even 3:30 later when Bryan Little was left unchecked in front of the net and swept a Todd White pass by Lundqvist. Girardi's goal with 6:27 left in regulation was set up when Zherdev shot the puck through the crease on a wraparound attempt, drawing Lehtonen out of position. Girardi scored on the putback for his second of the season. Vyacheslav Kozlov and Markus Naslund traded first-period goals that were the only scoring for the first 40 minutes. Kozlov snapped a shot that found the top right corner at 4:41 and Naslund struck at 12:25 to tie the score. Despite the Rangers' early cushion in the Atlantic Division standings, the focus in the dressing room is on not letting their sizzling October make them complacent. "We can't mistake what we're doing here for being great," Renney said. "The effort is, the intentions are, Henrik has been. We have moments of greatness in every game. But again, it's about sustaining that and getting ourselves to a level early that really forces your opponent to play under severe duress, if you will." As cold as they were to start the season, the Flyers now find themselves with a legitimate hot streak going. Jeff Carter's second goal of the game, a power-play marker with 23 seconds left in overtime, lifted Philadelphia to its fourth straight win after an 0-3-3 start. Mike Knuble also scored and Martin Biron made 34 saves for the Flyers, who are suddenly within one point of New Jersey and Pittsburgh for second place in the Atlantic Division. "Every team would love to have a guy like him right now," Knuble said of Carter. "You talk about the goals he's scored, but it's been a full-time effort. The guy kills penalties and stuff like that. He shoots the puck so well, he can be a force when he gets going. He plays in every situation." Andy Hilbert forced overtime by scoring with 7:20 left in the third period and Bill Guerin found the back of the net on a power play for the Islanders, but they managed just the single point despite a man advantage of their own early in the extra period. After the Flyers killed off a holding the stick penalty assessed to Kimmo Timonen at the end of regulation, they went on the attack and drew a holding call against Frans Nielsen at 3:44 of OT. On the ensuing power play, Joey MacDonald made the initial stop on Mike Richards, but Carter hammered in the rebound from the front of the left circle. Carter now has six goals and nine points during a six-game scoring streak. "I'm just shooting every chance I get," Carter said. "Every time I get a good look at the net, I'm putting it on there. It's nice this year to get off hot." Knuble put the Flyers up 1-0 with a one-timer at 7:45 of the first and Guerin's blast from just inside the blue line got the Islanders even 2:32 later. Carter made it 2-1 with 4:31 left in the first on a skill play, redirecting a long slap shot by Ossi Vaananen while on the backhand. Philadelphia maintained that lead well into the third before Hilbert got a fortunate bounce on a shot that bounced off the elbow of Vaananen and eluded Biron. "I told our guys that tonight was just like a tie," Islanders coach Scott Gordon said after his team's fifth consecutive loss. "The secondary point would have just been a bonus. It is more about the 60-minute body of work that we put together. Tonight, our guys played a good hockey game." Dany Heatley and Chris Kelly scored 5:25 apart in the third period to rally Ottawa over Florida for its second consecutive victory — and make it a little easier for Senators captain Daniel Alfredsson to enjoy his post-game meal. ''It makes a big difference,'' said Alfredsson, who signed a four-year contract extension earlier in the day. ''I'm really going to enjoy dinner tonight, I can tell you that, coming back the way we did." Alex Auld, who played for the Panthers two seasons ago, returned to BankAtlantic Center and made 25 saves. Keith Ballard's power-play goal with 5:41 left in the first period was the only blemish against the Senators' goaltender. Tomas Vokoun stopped 29 shots and had Ottawa blanked until the Senators went on a power play early in the third. Heatley scored his sixth of the season and tied the score at 5:55 by skating in from the corner and taking a quick wrist shot that beat Vokoun to the short side. Kelly then made his first goal of the season count, poking home a loose puck in the crease to put the Senators in front to stay. Vokoun stopped Chris Neil's wraparound attempt, but the puck remained loose in the crease. Jarkko Ruutu's rebound was also denied, but Kelly was able to push the puck past Vokoun. Ottawa ran into penalty trouble in the first period, as Shean Donovan and Jason Smith ended up in the box 61 seconds apart. Ballard's second goal since coming to the Panthers as part of an offseason deal with Phoenix for Olli Jokinen resulted from a wrist shot to Auld's stick side with Rostislav Olesz providing a screen in front. It took only nine seconds of the 5-on-3 advantage for Florida to take the lead. It wouldn't have really been fair to say Andrei Markov was slacking off when it came to his offensive responsibilities. After all, the Montreal defenseman entered Thursday leading the team with 10 assists over the first eight games. But there was still a big zero in the goals column, and Markov, who scored 16 of them last season, was waiting to bust out. He got on the board with a power-play goal 2:23 into the second period that broke a 1-1 tie and Carey Price made 28 saves as the Canadiens edged the Wild and handed Minnesota its second straight defeat. Special teams were a major factor in determining the outcome. In addition to scoring the winning goal during a 5-on-3 advantage, Montreal killed off all 10 power-play opportunities by Minnesota, which entered with the League's third-best success rate. Added coach Guy Carbonneau: ''It was awesome." Brent Burns got the Wild on the board just 1:31 after the opening faceoff and Francois Bouillon responded 2:57 later to get the Canadiens even. Both are typically defensemen, but Burns was playing up on the wing in this contest. Alex Tanguay had two assists for Montreal, now 7-1-1 and winners of two straight. Josh Harding started his first game for Minnesota, which had been 6-0-1 until losing at Dallas on Wednesday, and stopped 19 shots. Benoit Pouliot and Mikko Koivu went to the box 25 seconds apart early in the second and Markov made the Wild pay on the ensuing 5-on-3 advantage. Meanwhile, Price and the Montreal defense held strong when penalty trouble gave Minnesota some great chances to come back. Power-play opportunities came and went for Carolina and the game remained scoreless into the third period. Given another try, Tuomo Ruutu made sure the Hurricanes didn't let this chance pass them by. Ruutu deflected Eric Staal's shot through Chris Mason's pads with 9:41 left in regulation and Cam Ward was flawless on 19 shots taken by St. Louis for his seventh career shutout. ''I just tried to get my stick in the way, and it hit it,'' Ruutu said of his second goal of the season. Mason returned after undergoing an emergency appendectomy on Oct. 16 and made 28 saves, but the Blues still lost to the Hurricanes in St. Louis for the first time since the 1999-2000 season and only the fourth time in the last 20 years. The Blues had taken the first five minor penalties before the game was 32 minutes old, but kept dodging trouble. Paul Kariya was sent off for hooking at 9:40 of the third and the Hurricanes broke through this time. St. Louis was blanked for the second time in three games and tested Ward with only nine shots over the first 40 minutes. Fast starts to games have generally meant victories for Nashville, and this one helped lead to the first win this season for backup goaltender Pekka Rinne. Rinne turned aside 27 shots for his second NHL win and first since 2005-06. Shea Weber paced the offense with a goal and an assist while Patric Hornqvist and Martin Erat also scored for the Predators, who are 5-0 when leading after the opening period. Edmonton, which began a seven-game road trip with the date at Sommet Center, got a power-play goal from Sheldon Souray but lost its fifth straight after a 4-0 start. ''Rinne played well, but I have seen it enough to know that we have to be more productive,'' MacTavish said. ''A constant for us has been missed shots. We are not producing offensively. It's that simple." Hornqvist and Rinne saw to it that the Predators led after 20 minutes against the Oilers. Hornqvist, positioned low in the slot, redirected a Weber one-timer from point blank range and beat Mathieu Garon to his glove side at 9:59 and Rinne stopped all 10 shots he saw. Another one-timer off Weber's stick 1:28 into the middle period got past Garon for what turned out to be the game-winning goal. Souray quickly cut into the Predators' lead when he followed Weber's score 1:50 later with his own drive from the blue line that bounced high off the glove of Rinne and into the net. Nashville regained its two-goal lead midway through the third when Erat scored an insurance goal, beating Garon to his glove side from the top of the slot. The Pepsi Center in Denver had been a house of horrors for Columbus since it entered the League, but on the eve of Halloween the Blue Jackets turned it into a fun house instead, with Fredrik Norrena making 30 saves to lead the way. Jason Chimera scored a goal and added an assist while Derick Brassard, Andrew Murray and Jan Hedja also scored for the Blue Jackets, who had been 1-13 in Denver since their inception in 2000. 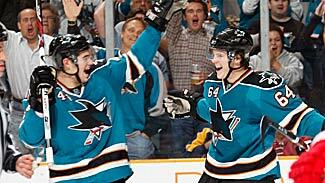 The franchise's only prior win there came was a 3-0 victory on Dec. 5, 2006. Columbus built a 4-0 lead before Colorado got goals late in the second and third periods from Paul Stastny and Tyler Arnason, respectively. Andrew Raycroft allowed all four goals on only 14 shots and was replaced by Peter Budaj after 40 minutes. The Avs have dropped their last two after a five-game win streak. "'I knew I could win here, but I also knew it would take a good performance. I'm a different guy leaving the building tonight. The first one is always the hardest.'' -- Blue Jackets goalie Frederik Norrena on his first win since March 26. The only goal of the first period came off Brassard's stick, as the young forward netted his fourth of the season by skating down the right wing boards and handcuffing Raycroft with a shot over his left arm. Chimera scored on a slap shot 8:30 into the second and the Jackets doubled their lead with goals by Murray and Hedja over the next 8:18 before Stastny scored with 1:30 left in the period to spoil Norrena's shutout bid. Arnason added a meaningless power-play goal with 1:27 left in regulation, but Norrena was already on the way to his first win of the season. Miikka Kiprusoff has played every minute in net for Calgary during the month of October. He appears to be thriving on the work. Kiprusoff made 13 of his 29 saves during the third period as the Flames held off the Bruins at Pengrowth Saddledome, moving into a tie with Minnesota for first place in the Northwest Division. "Kipper was huge again tonight, making some huge stops, not only throughout the game, but in the last minute, a couple right in tight," defenseman Dion Phaneuf said. "When you have a guy like that behind you, our job is to let him see the puck and he's doing a great job stopping it." Phaneuf made sure the Calgary power play clicked during the second period, helping turn a 1-0 deficit after the first 20 minutes into a 2-1 lead after 40 with a goal and the primary assist on Mike Cammalleri's go-ahead score. Dustin Boyd also tallied for the Flames. "We were playing a team that's been playing well defensively, not giving up a lot, and their goalie was playing well," said Phaneuf. "On the PP, we were just trying to get pucks through with lots of traffic, and luckily they went in." Patrice Bergeron opened the scoring for the Bruins and Blake Wheeler capped it in the third period, bringing them to within a goal with 7:44 left. But Boston saw its three-game win streak — which included consecutive 1-0 victories at Edmonton and Vancouver — come to an end. "I think once you look back on it, it was a very successful trip," Wheeler said. "You know, going into two tough places and getting two wins, but I think we're at the point right now where we're trying to be selfish, try to go into every game trying to win. We didn't bring our 'A' effort tonight and they took it to us, so we lost the game." Phaneuf's game-tying goal, which he scored after Jarome Iginla's cross-ice pass intended for Todd Bertuzzi deflected off a stick into the slot, ended the shutout streak of Boston goalie Tim Thomas at 152 minutes, 14 seconds. Thomas was only the second goaltender in NHL history to record back-to-back 1-0 shutouts on the road. The Bruins head home to play Dallas on Saturday after their grueling trip through Western Canada. "It's been a lot of travel, a lot of different time zones here on this Western trip," Thomas said. "I don't want to make excuses for the guys but maybe that affected us a little bit. We showed our character (by) finishing up strong." Roberto Luongo made 28 saves, including a denial of Alexander Frolov's first-period penalty shot, and Daniel Sedin recorded a power-play goal and assist as Vancouver made a bit of history. Mason Raymond, Kyle Wellwood and Taylor Pyatt had the Canucks' other goals as they turned the tables after getting blanked 1-0 by Boston on Tuesday. It also marked their first shutout in 106 visits to the Forum and Staples Center since joining the NHL for the 1970-71 season. "I didn't get much action in the first 10 minutes because we had a lot of power plays," Luongo said after his 40th career shutout. "But then I was able to see a few shots and the guys were doing a good job in front of me, clearing rebounds and breaking up a couple of backdoor plays in the last few seconds." The Kings spent most of the first five-plus minutes shorthanded after Dustin Brown received a double minor for high-sticking 56 seconds in and Matt Greene went off at 4:07 for hooking. The Canucks couldn't take advantage of the ensuing 5-on-3, but after Brown's penalty expired, Sedin banged home a rebound from just outside the crease at 5:09 for all the offense Luongo would need. "It was a tough start," Kings coach Terry Murray said. "We got a double minor in the second minute of play, then it ends up a 5-on-3. You're just trying to get the game going and get everybody involved. We just about got it killed off and they end up poking in a loose puck." Still, the tide could have turned in the Kings' favor when Frolov was awarded a penalty shot with 3:18 left in the period after being pulled down on a breakaway by Sami Salo. Frolov skated in alone on Luongo and tried to go to his backhand, but had the puck slide off his stick as he cut through the crease. The Canucks then grabbed the momentum and increased their lead to 2-0 just 2:11 later as Raymond stickhandled around Kings rookie Oscar Moller after faking a slap shot and put a wrister past Jason LaBarbera during a 4-on-4 situation. Wellwood added a power-play goal midway through the second and Pyatt tallied his first of the season 6:13 into the third. "It was definitely nice to get that first one," said Pyatt, who scored 16 goals last season. "It feels like a lot of weight is off my shoulders. It's tough when you go your first stretch of the season without scoring because you're feeling a little stressed out about it." Material from wire services and team broadcast and online media was used in this report.